There are two major corneal refractive surgeries: LASIK and PRK. Both are laser-based, very similar in method, and have the same long-term results, although PRK has a longer recovery. Nearly everyone knows someone who has had a successful LASIK procedure. Most people come into my office asking for LASIK. Some of these people are better candidates for some other procedure. Part of my role is to educate them about their other options. There are some surgeons who pride themselves on being LASIK surgeons. 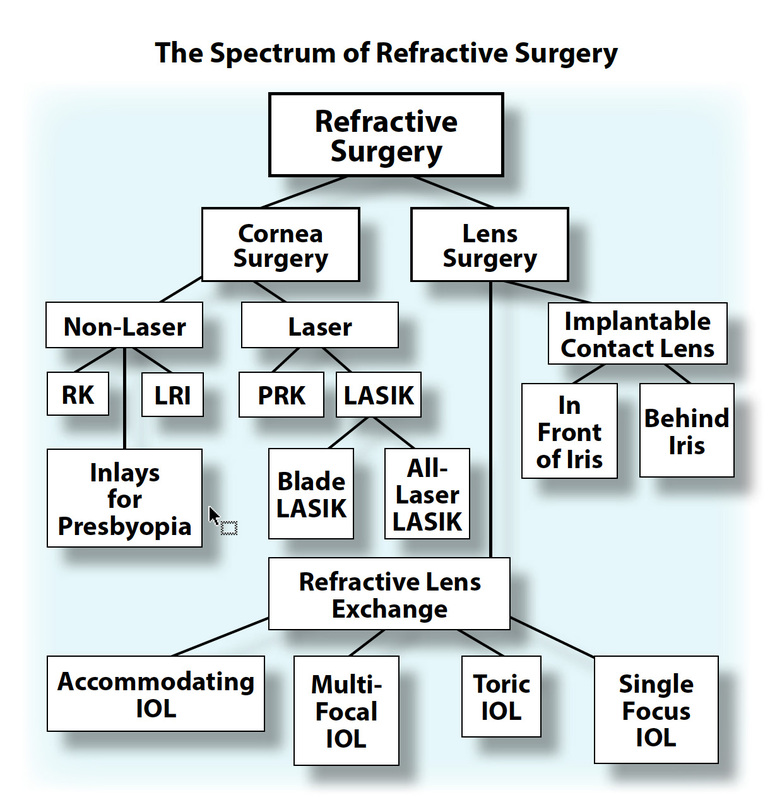 I believe that it is important to be a complete refractive surgeon, not just a LASIK surgeon. I believe that a surgeon should master all of the procedures in Figure 9 to properly take care of the range of patients we see. There is an old saying that, “If your only tool is a hammer, everything looks like a nail.” This is the trap that surgeons who do only LASIK can fall into. Figure 10. In LASIK, a laser separates the outer layers of the cornea, which are pulled back to make a flap. An excimer laser then reshapes the exposed surface to correct vision. The flap is replaced and sticks without sutures, allowing rapid healing. There are also nonlaser cornea-based refractive surgeries, such as the new corneal inlays, which I will discuss later in this chapter. Figure 9. No one procedure is right for everyone. The surgeon needs to evaluate each patient individually and select the appropriate procedure. 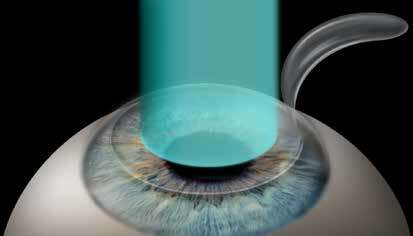 LASIK (laser in-situ keratomileusis) is the mainstay of refractive surgery today and is usually an excellent choice for low to moderate degrees of nearsightedness, farsightedness, and astigmatism. In LASIK, the surgeon makes a flap on the surface of the cornea. The flap includes the outer layers of the cornea—the epithelium and part of the stroma. The flap is about as thick as a soft contact lens and attached at the upper part of the cornea, under the eyelid. The flap is folded back, exposing the underlying tissue (the stroma). An excimer laser is then applied in a preprogrammed, computer-controlled pattern to reshape the cornea (Figure 10). The flap is replaced and sticks by itself, almost like Velcro. Replacing the flap restores all the layers of the cornea, so the healing is very fast. The excimer laser is uniquely suited to the task of refractive surgery because it ablates, or vaporizes, tissue by breaking apart the molecules without heating the tissue left behind. The unparalleled precision of the excimer laser makes it the ultimate reshaping tool. Each pulse of the excimer laser removes only 1/100,000 inch of tissue. The laser is so precise that it would take 600 pulses to shave through one strand of human hair. This precision allows the surgeon to sculpt the cornea into the correct shape to allow rays of light to focus properly on the retina. The result is sharp vision without glasses or contacts. There are two ways to make the flap. Traditionally, the flap was made with a fancy vibrating blade called a microkeratome. This is usually called blade LASIK. Nowadays, the best way to make the flap is using a femtosecond laser. 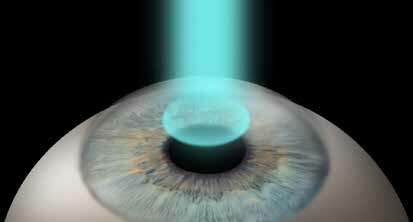 This laser outlines the flap by creating a sheet of millions of tiny bubbles that separate the flap from the cornea. The femtosecond laser is very expensive, so there are still many surgeons using the older microkeratomes, but the trend is strongly toward laser flaps. A laser flap is more precise and safer than a microkeratomecreated flap. LASIK performed with a laser flap is called all-laser LASIK. All-laser LASIK takes about five minutes per eye and is a painless, in-office procedure. Recovery takes four to six hours. Most people see 20/20 or better the next day. LASIK is discussed in detail in a chapter 5. PRK is an abbreviation for photorefractive keratectomy. PRK was the first refractive procedure done with a laser, and is the predecessor of LASIK. In PRK, the outer cell layer of the eye (the epithelium) is gently scraped away. This exposes the underlying stroma, a firm fibrous tissue that makes up the bulk of the cornea. The same excimer laser used in LASIK is then used to reshape the cornea, in exactly the same manner as LASIK (Figure 11). The PRK procedure takes about five minutes per eye and is painless. Just as with LASIK, PRK can correct nearsightedness, farsightedness, and astigmatism. The main difference between PRK and LASIK is the speed of recovery. With LASIK, the healing is a matter of hours, and your vision is excellent the next day. With PRK, the outer cell layer, the epithelium, needs to regenerate. The epithelium takes about four days to completely recover the area of laser treatment. During these four days, your eye will be irritated and feel scratchy. It takes several weeks for the epithelium to become completely smooth. During these weeks your vision will be improved but not yet perfect. There are several situations in which PRK is preferable to LASIK, despite the slower recovery. If you have a thinner-thanaverage cornea, there may not be enough tissue left after the LASIK flap is made to safely reshape the cornea with the laser. PRK is also preferable to LASIK if you are suspected of having a distortion in the cornea called keratoconus. You’ll find more detailed information on PRK in chapter 6. Figure 11. PRK is performed by directly shaping the outer layers of the cornea with an excimer laser. Unlike LASIK, there is no flap. Cornea-based refractive surgeries, such as LASIK and PRK, are appropriate for most people, but don’t work as well for people with high degrees of myopia or hyperopia. For these individuals, lens-based refractive surgery is often preferable.